Language development starts at birth. Our fun free text messages can help! Since you're already a Kinsights user, you only need to fill in a few details. For registration in the program. For research & to customize your program. to talk to your young children. We help make it fun. Did you know? Our brains develop most during the first 3 years of life. When you talk and play with a child, you are helping him develop a healthy mind! 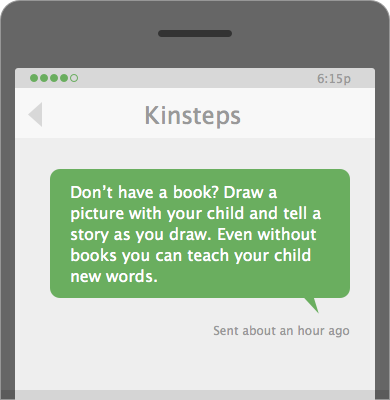 The Kinsteps Program By sending you three text messages each week, Kinsteps teaches you to help your child learn to talk. It’s Totally Free!. Standard text rates may apply, but that’s it, so why not get started right now? Or you can simply share via email. Created by Pediatricians and Tech Companies Devoted to Improving Children’s Health and Development. Kinsights is a San Francisco-based online parenting community and the provider of the most advanced pediatric personal health record. Passionate about early child development, Dr. Olson is currently a neonatal hospitalist at Stanford University. She completed her residency at the University of California, San Francisco where she was a member of the Pediatric Leadership for the Underserved Program. Her academic interests include pediatric development, mobile health, and access to health care services. Currently a fellow in developmental pediatrics at Boston Children’s Hospital, Dr. Wilkinson has a research interest in language development. She earned her MD and PhD in neuroscience from UCSF, where she also completed her residency, and graduated from Princeton University. Kinsteps’ data is available free of charge to qualified academic researchers. If you’re interested in using Kinsteps in your research, leave us your email and we’ll be in touch. Kinsights is a smarter parenting community, helping you get thoughtful advice from parents like you.